Snack Girl has been asked multiple times about canned soup and I couldn't bring myself to research the topic. Why? Well, I make this chicken noodle soup (see: Low Calorie Comfort Food - It Exists!) and I don't like canned soup. BUT, I understand that there is a need (college students without kitchens, people who hate to cook, etc.) to eat them. I went out and spent some time in the soup aisle at my local supermarket. In fact, I was there for such a long time that the management called security :) Yeah, there are a ridiculous number of brands, flavors, prices.....aaaah! See that cute bowl of Campbell's in the top photo? 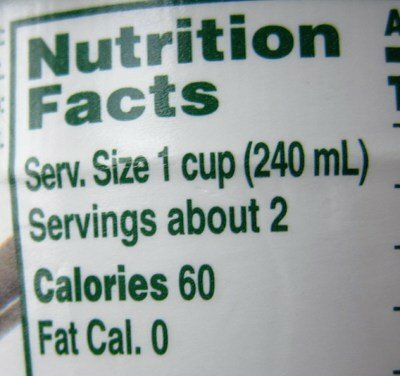 It states "60 CALORIES" on the front of the soup container - but there are 120 CALORIES in that bowl. The container looks like one serving but it is actually TWO. This was true of all the soups that I looked at - there are 2 servings in a can of soup. Most of us would eat the entire can at once - it fills a standard size bowl - and what are you going to do with the leftovers? Secondly, there is a serious issue of sodium amounts in these soups. On average your daily amount of sodium should be between 1500-2300 mg. If you ate the entire bowl of "Select Harvest Vegetable and Pasta" soup - you would consume 1300 mg of sodium or over 50% of your recommended daily amount. Finally, I tried the Campbell's Vegetable and Pasta and I subsequently poured it down the drain. I have one word for this soup - yuck. I kept searching for something healthy (would I give up on you guys?). I visited the "Natural Foods" area of the store and scoured the shelves for a healthy soup - and I found one! See the "Health Valley Organic" in the above photo? It has no salt added (really) and was packed with vegetables that actually tasted like vegetables. I ate the whole can after I added a wee bit of salt. I have to say that for a canned soup this was great! You could mix it with other higher sodium canned soups for a saltier (but not too salty) canned soup experience. What about cost? 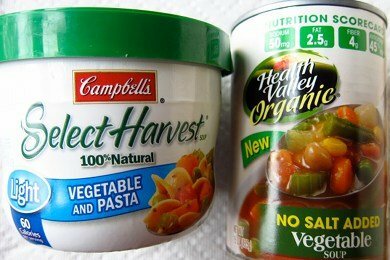 The Campbell's Select Harvest set me back $2.65 and the Health Valley Organic was $2.99. I think that was 34 cents well spent. How do you deal with the canned soup aisle? The amount of servings in One Can is ridiculous! Who only eats a portion of a can? Please Tell me. Do I want to know why you are recommending to stay away from cream soups? I've also found the sodium content too high, especially on the soups labeled 'healthy'. The sodium content is higher than the soups without the 'healthy' tag. We don't eat canned soup that often but we do from time to time. Mostly because I have not mastered how to make a soup that my kids will actually eat! I'll keep an eye out for the Healthy Valley brand. Thanks! I know that each can of soup is 2 servings, but I always eat the whole can! I also try to stay away from canned soup. I just learned how to make homemade tomato soup from tomato sauce and it's rediculously easy! I hate to be the one that brings the snark to the party, but I have to point out that neither 60 nor 120 calories are enough to be called a meal. Yes, the sodium is in the "holy crap" range, but if you're strictly looking at a calorie count, even 2 servings is an extremely low-cal meal. In my personal experience, a can of these soups has been a sufficient, "shoot, I forgot to pack lunch--OK, this will work" deal, and the sodium count is balanced by eating a healthy dinner. I like Amy's Vegetable but it is pretty high in sodium so I'm going to keep an eye out for Health Valley and give it a try. I usually add some more veggies - broccoli and snow peas are faves of mine - while it is cooking (I don't have a microwave and heat my soup the old fashioned way on the stove...) and break a raw egg in when it's at a boil to add some protein. On work days that's typically one of my meals. It really fills me up and thanks to the egg keeps me feeling full for a long while. @E - cream soups have a ridiculous amount of fat (and saturated fat). they are treats! @LindseyAnn - I agree that 120 calories isn't a meal - and agree totally with your balancing with a low sodium dinner - I just wanted to point out that you might think you are only eating 60 calories. I like the Healthy Requests soups, and realize that they ARE 2 servings. However, I often find that I only eat about 1 1/2 servings instead of 2 servings. Yes, I throw out a 1/2 serving, but they taste good, fill me up and I stick with my points' allotment quite well. When I have a can of soup I usually pour out the liquid and just eat the goodies! I havent bought canned soup in more than 10 years. I ALWAYS make my own. Boil vegetables you want in your soup, season to taste (basil, onions, oregano, cumin, thyme - other spices) and I then add a little tomato juice to give it a red color. I let the amount of tomato juice determine how much or if I will add a little salt afterwards. This way, the "broth" is mostly water with tomato juice added for color and a little more flavoring. This all takes about 15 - 20 minutes. This way, I can make a nice sized pot and eat some for a few meals. I sometimes add ground turkey as meat. Other times, I've added baked, boiled or grilled chicken or even baked turkey. Either way, there's no need to ever buy canned soup again. Great article. No, I really mean it. I feel the same way about the sodium content in canned soup. I wrote the name "Health Valley Organic" down and will definitely try some this week when going grocery shopping. Thanks for doing a soup review Snack Girl! I know canned soup has a lot of sodium but like @LindseyAnn said, I balance that with a healthy dinner (I don't get or add much sodium in the rest of my diet). Given that I am often too busy to make my own lunch (and certainly too busy to make my own soup, although I would love to be able to do that), the high sodium for a convenient can full of vegetables (and, in the soups I buy, black beans for protein) is a trade off I am willing to make. @Kelly - I like your idea of pouring out the liquid - there is often way more liquid than I want anyway. I like the Amy's soups (southwest roasted veggie is very tasty) but they are pricey (close to $4 per can). I'll look for the Health Valley Organic brand too. Not sure what happened to my comment? I will have to look for healthy valley organic. This isn't exactly a "canned"soup, but I found it on the soup isle. It's called Bear Creek and it's in a pouch. All you add is 8 cups of water and the ingredients in the pouch. The stats for it are not that bad, depending on the kind of soup. They have a good variety; such as Minestrone, Chicken Noodle, Broccoli & Cheese, Creamy Potato, Vegetable Beef and there is even a Chili. It costs about $3.69 a pouch (I have found it on sale at Buy 4 Less for $1.79) but you're getting 8 cups. Not canned, but it is convenient and it tastes really good. An alternative to a quick "almost canned soup" i recently concocted trying to keep my calorie count to a minimum and pasta out of my soup was to start with a can of ro-tel tomatoes (diced with chiles) and added 1 diced zucchini and 1 box of low-sodium fat-free chicken broth. I boiled until the zucchini was tender, then divided in to 2 bowls. I added 3.5 oz of diced chicken to each bowl and was totally excited with my results. Less than 200 calories per bowl and lots of yum and very full! does anyone have a good tomato soup recipt? homemade.